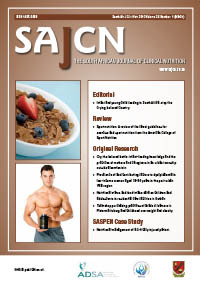 Evidence-based sport nutrition guidelines which explore the connection between nutrition, exercise and well-being form a crucial part of any athlete’s competitive and training programme. Guidelines that are based on sound scientific evidence about the quantity, structure and timing of food intake are important to ensure that athletes train more effectively to reduce the risk of injury and illness. Appropriate nutrition complements training and recovery and can induce metabolic adaptations to training. Adequate energy should derive from a variety of foods that provide carbohydrates, proteins, fat and micronutrients. Maintenance of the energy balance in individuals with increased requirements because of physical activity is important. Challenges may arise in the case of larger athletes and those who partake in high-volume intense training. Habitual carbohydrate intake is essential for physically active individuals and should be timed according to training sessions to ensure optimal pre-, during, and post-workout nutrition. Dietary protein requirements are slightly elevated in the case of strength, speed and endurance training. Consideration of the quality and timing of protein intake is important. The fat requirements of athletes are similar or somewhat higher, so consumption of adequate amounts of fat is essential for optimal health, maintenance of energy balance, optimal intake of essential fatty acids and fat-soluble vitamins. Vitamins and minerals are needed to provide a health benefit, although the ergogenic effect of most micronutrients is still unclear and warrants further research. Supplements and sports foods are used extensively and although the use of some supplements may be ergogenic, the risk to benefit ratio needs to be carefully considered before embarking on the widespread use of supplements.